I think some of you are already familiar with Feline Yogi’s yoga mats for cats. 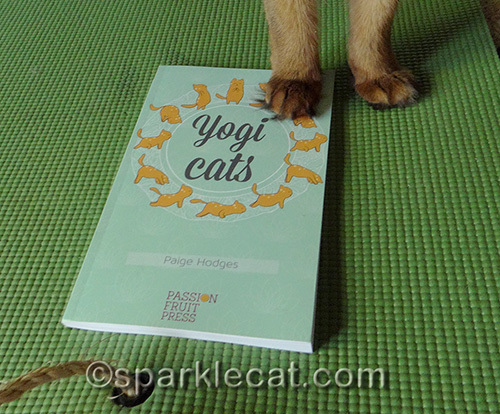 Well, on March 5, the human who makes them, Paige Hodges, has a new book coming out called Yogi Cats! In spite of the title, it is actually a nice little yoga book for humans. 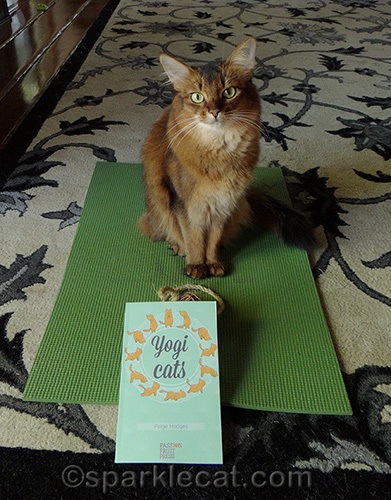 We cats don’t need a yoga book — we are already really amazing yogis! And that is the premise of the book: learning the more inner aspects of yoga through cats. 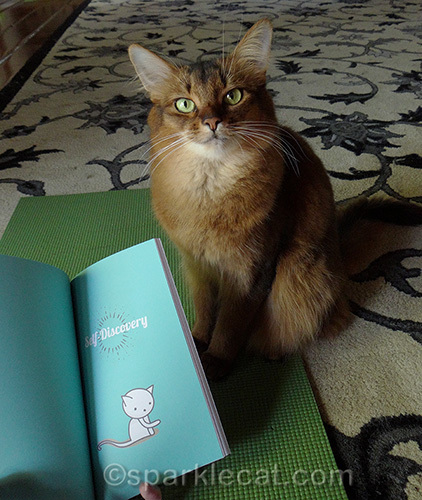 Each chapter focuses on a different pose, and a different challenge for humans, plus there are lots of cute kitty drawings, and quotes from respected yoga leaders such as B.K.S. Iyengar and Erich Schiffmann, and other wise humans like Eckhart Tolle. Look! There’s even a chapter for Binga. 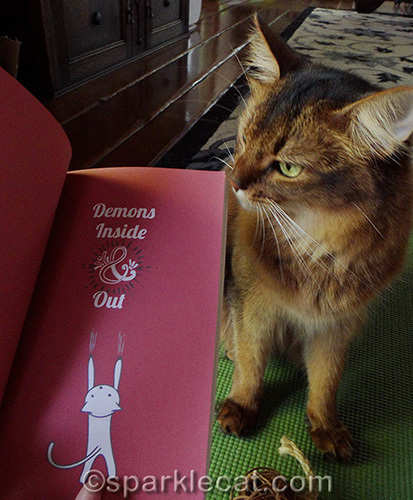 So maybe some cats can get something out of this book in addition to humans. If you do yoga, you will really like this wise and winsome little book. You can get it at Amazon now — or you can enter my giveaway below because I have one copy for a lucky reader! United States residents only — good luck! Disclosure: I was given a complimentary review copy of this book. Links to Amazon and to Feline Yogi Etsy store are affiliate links. That looks like a fun book!!! I love anything yoga and cat related. Looks like a fun read. Thanks for the giveaway! What a great giveaway! I bet there are lots of kitty and yogi people out there like me. I was all set to comment yesterday and then discovered I was on TW’s FB account and we couldn’t have that. Sounds like a fun book. Love all cat items books included. And i commented. Oh man, what a cute book!! Hey our humom does yoga. We luv her mat. She would luv this book. And and gotta get her to get us one of those feline yoga mats. She says she’s gonna get us one from CatConLA this year. Purray! Good luck everyone! That is a cool book! Meowmy sometimes does some yoga moves to stretch and relax. Yoga for cat! Our Wiley can now join dad in yoga! That sure does look like an adorable book, Summer. Thank you for having such a neat giveaway! we like the illustrations! thanks for the review, Summer, and the chance to win a copy. good luck to everybuddy that enters! Such a cute idea. I love the art style too. That looks like a very cute book! Thank you for having another cool give away! I like your paw of approval, Summer, and your cat yoga mat. We hadn’t heard of cats doing yoga before Summer so maybe we should try it ourselves.